EnviroIngenuity Standard Home Garden 8 stacking pot tower (Sandstone in center) planted with Red Bok Choy. Background: Custom Home Garden tower with 8-stacking pots in Terra Cotta. Enjoy clean, all-natural home grown produce! 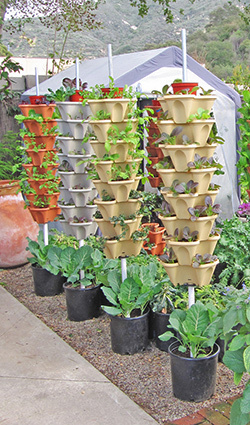 EnviroIngenuity® Vertical Gardens from Alegría are offered with everything you need to start growing healthy greens, vegetables, herbs, and fruits at home. 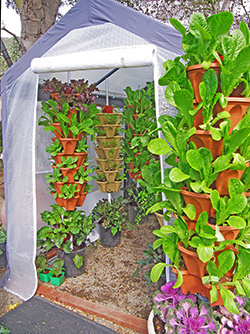 Our custom, single-tower hydroponic Vertical Garden systems can be placed anywhere there is sufficient light, including balconies and patios or installed as vertical gardens in your existing raised-bed garden. The Vertical Garden can be moved easily and the stacking pots can be removed and taken inside should weather conditions become severe (too cold or too windy). 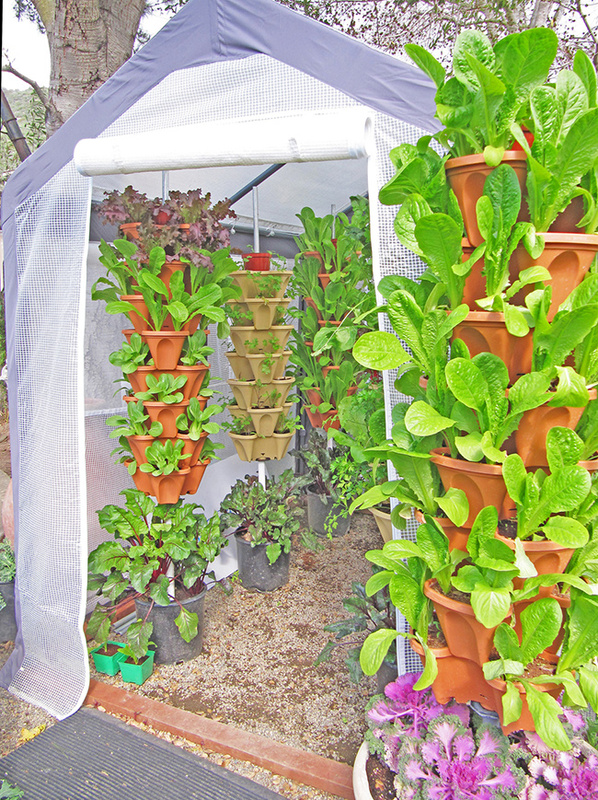 Up to 50 plants can be grown in less than two square feet. And replanting is simple, just remove the pots, recycle the coir, replant with new seedlings and re-stack. Each Vertical Garden tower comes with patented stacking pots, a custom base pot, all hardware to assemble the tower, plus specially formulated plant nutrients. Certified organic, non-GMO seeds and mature seedlings ready-to-plant are available on special order. Our stacking pots are available in three colors to match your décor. 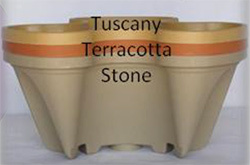 Choose either Terra Cotta, Sandstone or Tuscany or mix and match to suit your taste. The standard Home Garden tower comes with six (6) stacking pots and a large custom base pot from our inventory. We recommend a maximum of eight (8) stacking pots per tower. Home installation, consulting (design/build residential and commercial hydroponic vertical farms), automatic watering systems and custom planting services are also available. 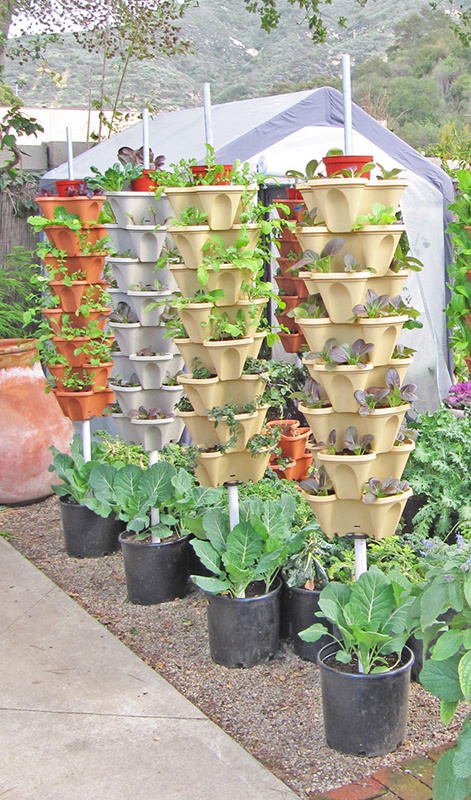 EnviroIngenuity® Standard Vertical Garden towers from Alegría employ a 5-gallon base pot instead of the custom base pot and are best used in raised bed gardens to grow vertically along with your organic root crops in the raised bed. 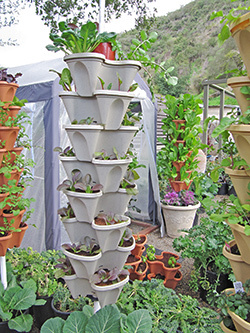 Standard Systems are shown with two 8-stacking pot towers in Tuscany (Standard Vertical Garden in soft yellow foreground), one tower in Sandstone (Standard Vertical Garden in light grey center) and Terra Cotta (Standard Vertical Garden in brick red background). 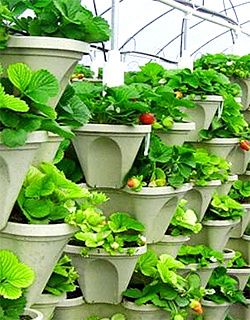 The Standard Vertical Garden tower systems come with a black 5-gallon base pot, conduit, spacer, washer and 6-stacking pots. The tower is supported by setting the 3/4" conduit 16" into the ground making it easy to add vertical towers to your existing organic garden. 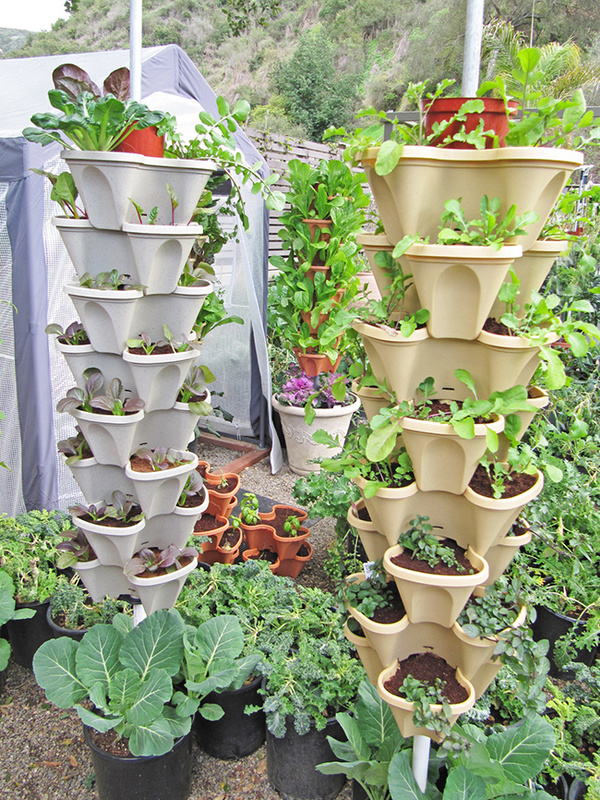 EnviroIngenuity® Custom Vertical Garden tower with 8-stacking pots and a large custom base pot (24" diameter) shown. We carry a large selection of custom base pots to match your décor or you can bring one of your own in and we can customize it with the tower support hardware. The custom vertical garden system is ideal for decks and patios or rooftops and does not require support conduit to be driven into the ground. Shown planted with strawberries in the eight (8) stacking pots and edible flowers (Calendula and Borage) and Blueberries in the large custom base pot. EnviroIngenuity 6-tower Mini-Greenhouse system. Features a 6'x 8' greenhouse protecting 6-towers with 8-stacking pots each for a total of 48 stacking pots and six (6) 5-gallon base pots for larger plants such as beets and kale. Planted with six (6) plants per pot gives a total of 288 plants in the stacking pots and 24 larger plants in the base pots for a total of 312 plants, all in less than 50 sq. ft. This system produces over a pound of greens per day providing a family of four a fresh, nutreint-rich mixed salad each day. The mini greenhouse can be manually watered or set up with a separate hydroponic drip automatic watering system, 55-gallon barrel, chlorine/flouride filter, and heating/cooling controls (optional and additional). Includes 55-gallon barrel, timer, plumbing and hardware for hydroponic drip system, chlorine/flouride filter, greenhouse and base, 48 stacking pots and 6-base pots, 216 planted certified organic non-GMO seedlings of your choice (with up to 312 seedlings optional, add $200) and installation. For delivery within Orange County add $75 or will-call (No Charge) basis available.